My high rise quilt is complete! It feels good to have this quilt finished, since it was a WIP for over 3 years. And, it feels especially good to get something this large finished in December! I've got a lot of photos to share, and then I'll give details about the quilt at the end of the post. Pattern: Original design, hopefully to be a pattern someday! I really like how this one turned out! Purple, orchid and all! Ha! Great finish. I love the quilting motif. Congratulations! 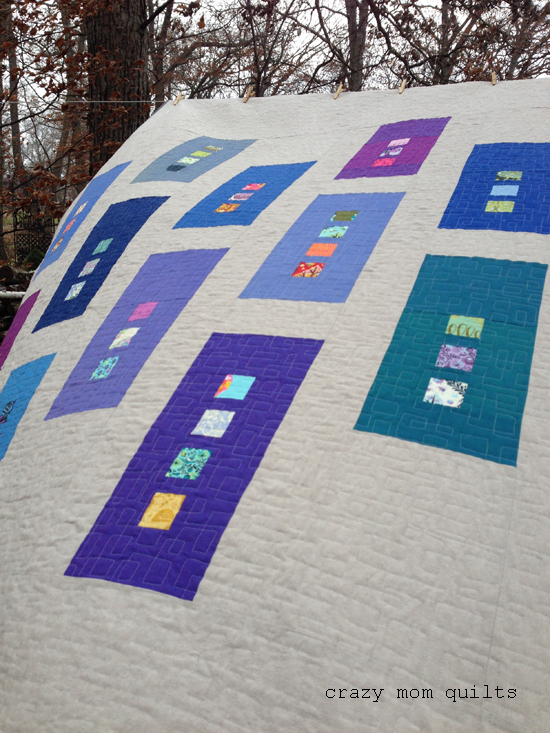 The quilting gives it a great texture and I know what you mean about celebrating a big finish in December. very unique quilt. I like the way you quilted it. Beautiful finish Amanda - so modern. Your shoulders deserve a holiday from all that quilting but it sure looks good ! This is so pretty! I just love all the different blues and purples. Just lovely! I guess the 3-year time out was worth it! Just a perfect finish for a chilly December. Love all of those beautiful cool tones!!! Gorgeous color choices! And YAY on something BIG completed in December! Wow - what a gorgeous top. I love that quilting pattern! You are always an inspiration! Love the quilt and the quilting is awesome. This is a beauty. It was fun sitting next to you and seeing it come together. I love the quilting on it!!!! Finished my Trees! 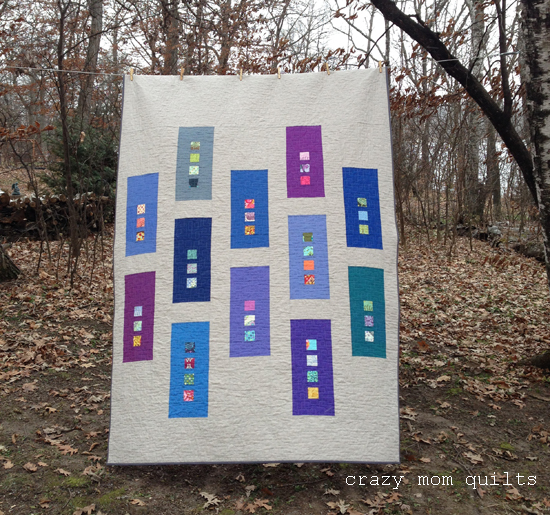 quilt, and blogged it! YAY!! Congrats on this big and bold finish! 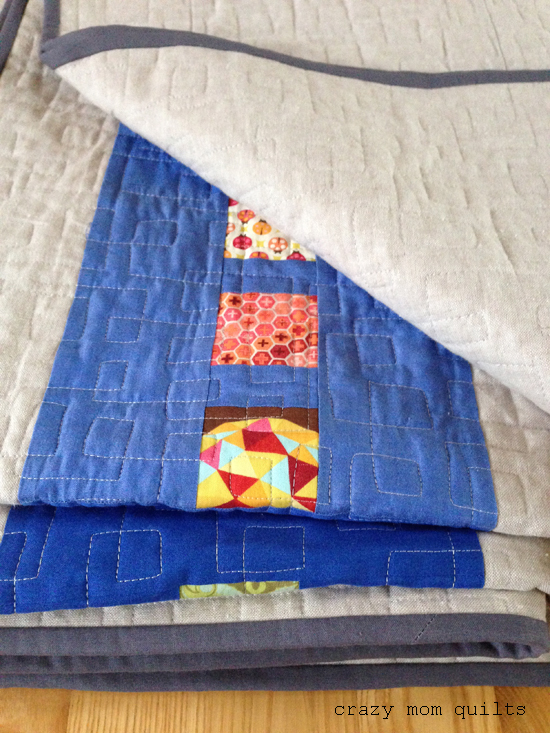 Love the boxy quilting! Congratulations Amanda! Everything about this quilt is just wonderful!!! Especially the quilting! Beautiful quilt, and that backing fabric is awesome and perfect for it! You inspire me with every post. Now I'm anxious to try this quilting motif. 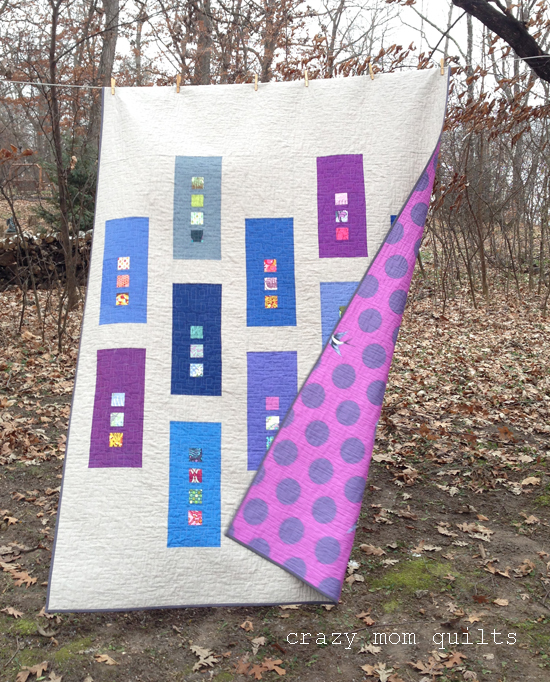 Love the colors in this quilt and the backing fabric is just perfect! Congrats on finishing a big project! Oh that's a beauty! I love the clean modern design and the backing fabric is a great choice. What a lucky person to be given this quilt. 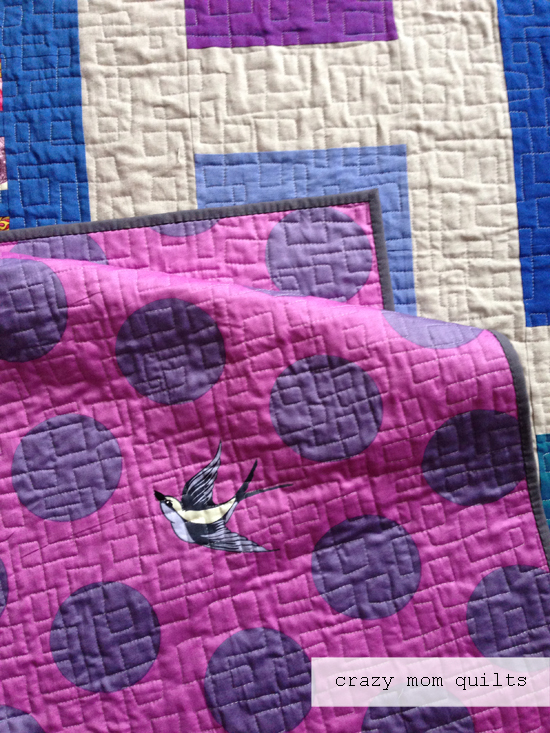 Thank you for the link up Amanda, it's so interesting meeting other quilters through your blog. Nice! I really like the quilting design! Hi Amanda - I love this quilt. Clean modern design and the colour combinations are great - especially the backing. Love it! A gorgeous quilt ... amazing quilting job! I like it - and the back is great too! What a wonderful quilt. The squared-off stippling is fabulous. 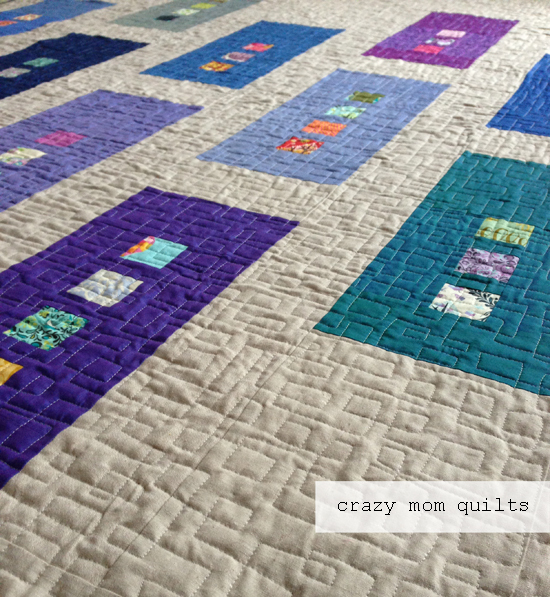 I love everything about this quilt, the design, the colors, the quilting! Would love to see a tutorial for this one! I'd like to offer one caution: BEWARE color bleeding with that quilt back! Several people have experienced serious bleeding with that super saturated Tula wide back fabric. "Hopefully to be a pattern someday." Whoop! Whoop! Love it! This is an adorable happy quilt! Congrats on getting it finished up! Feels sew good, doesn't it! Beth: have you used the backing fabric. Do you know first hand about the bleeding of colors? So very fabrics run today. It is a great quilt. Where can I find the pattern? There isn't a pattern yet, but I hope to make it into a pattern someday soon! 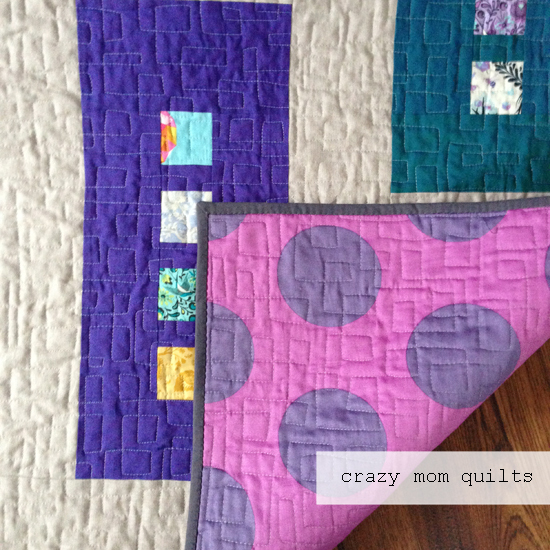 Ooh, I love the quilting motif and all the PURPLE! !